This is an 8 round Swiss competition held from 17th May to 14th June (excl. 7th Jun). Two Rapid play games per night, with a time control of 40mins per player. A maximum of 4 half point byes may be given to absent players. A full point bye will be given to non-paired players and count as a played game. 5 played games are needed to qualify. The outright winner will be awarded the Peter Keffler Shield and be “Club Champion”. Another shield will be awarded to the best improver, based on performance in excess of grade during the competition. No player can win both trophies. Competition results will also count towards the club ladder (ends 28th June). Eight games throughout the season are needed in the ladder to qualify. The ladder winner is awarded the Bullwinkle trophy board. Open, U160, U130 and U100 sections. Time Control is 25 mins plus 10 sec incremental time control over 6 rounds. Essex Juniors – free entry. Format: Five-round Swiss. Four sections – Open, Major (u170), Intermediate (u145) and Minor (u120). A qualifying event for the British Championships in 2017. Swiss system tournament, presented by Braintree Chess Club. Only the first 100 entries can be accepted. Prizes for overall performance, gradings and age. Click here for details and entry form. This season’s 9 round Swiss is being held from 19th May to 16th June. As last season, this is no longer handicapped and the award of the shield will again be based on performance in excess of grade. Time controls are 40 minutes per player. A ½ point bye may be given to absent players, to a maximum of 5. Format: Five-round Swiss. Four sections – Open, Major (u170), Intermediate (u145) and Minor (u120). A qualifying event for the British Championships in 2016.
and the Essex Junior Championships (all decided by results in the Open). Register in advance, pay on the day. Click here for further details and entry form. 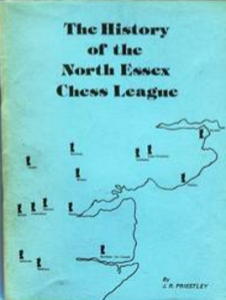 Did you know that the North Essex Chess League is 50 years old this season? 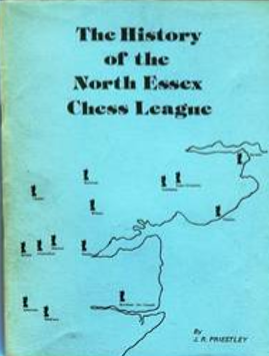 A 1986 publication by J.R.Priestley titled “The History of the North Essex Chess League” stated that “play begun in Autumn 1964”, so the current 2014/15 season is a semi-centenary. A few local players have this book which has enabled our table of league winners to be extended back to 1964/5 season, though full game details only go back to 2002/3 season for league and to 1998/9 for the Knockout and Plate events (transcribed from spreadsheets provided by events secretaries). Perhaps you have further details or early spreadsheets in your archives covering earlier seasons to help fill in the blanks? Clubs shown on the above cover are Billericay, Braintree, Burnham-On-Crouch, Chelmsford, Clacton, Colchester, Essex University, Felsted, Harwich, Maldon, Marconi, Wickford, Witham and Writtle. Some of these later closed, had breaks or re-named and a few more recently formed clubs have since joined. Some, such as Clacton and Braintree, pre-date the NECL, having played in the earlier established Essex League prior to the First World War. Any volunteers to write an article putting all this together, as an on-line update to the earlier book? Any suggestions to put to the Committee on how to mark this occasion? Format: Five-round Swiss. Four sections – Open, Major (u170), Intermediate (u145) and Minor (u120). A qualifying event for the British Championships in 2015. This season’s 6 round swiss is not handicapped and the award of the shield will be based on performance points in excess of grade, with 3 played games needed to qualify.